Colours shimmy in the sun, and the slow pleasant inebriation of thin-aired altitude, mid-afternoon haze and coca-high are all playing nicely in my head. Not so distant ahead, the sandaled figures of the villagers grip the rock pathways that edge upward. Jackie, as is his way, looks razor-sharp and almost tidy somehow, even though everyone around him is covered in a kind of dusty sweat. He and I both are masticating like small calves, with our daily hit of coca. The Chawaytiri community are gifted weavers with a long tradition. 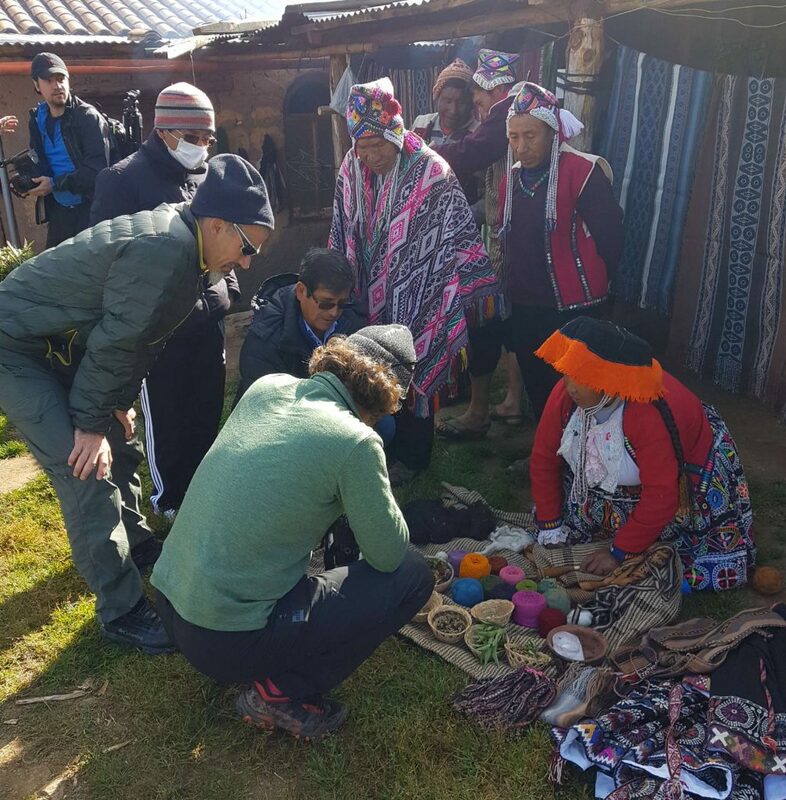 Here, a woman weaver is explaining how they use and dye alpaca wool. 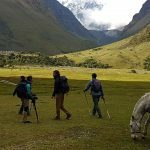 We are just outside the Andean village of Chawaytiri—meaning Village of the Llama, or Eye of the Llama—that sits at 12,000 feet in the highlands, just 50 kilometres from Cusco in the Sacred Valley of the Incas. We are ascending—always it seems, we ascend. Amid the haze and the coca, the pathway beneath me looks brittle and almost decrepit. Maybe forgotten is the right word; it looks forgotten. The end result: finely-woven ponchos, tablecloths, blankets, wall hangings and any number of other items. It is another section, a very different section, of the Qhapaq Ñan—the Great Inca Road. We have been told the road ran through and beyond the village and remnants of stone lie everywhere. Ancient tributes and scribblings on a mountainside in honour of the llama await us, I am also told. Our “guide” in this is, in fact, a body of guides—several members of the village are leading us to the markings on the outskirts of the village, and we walk together without fanfare, one by one, in quiet comfort. We’re heading to see the llama pictographs. The path we take is a piece of the original Great Inca Road, with Inca ruins in the distance. 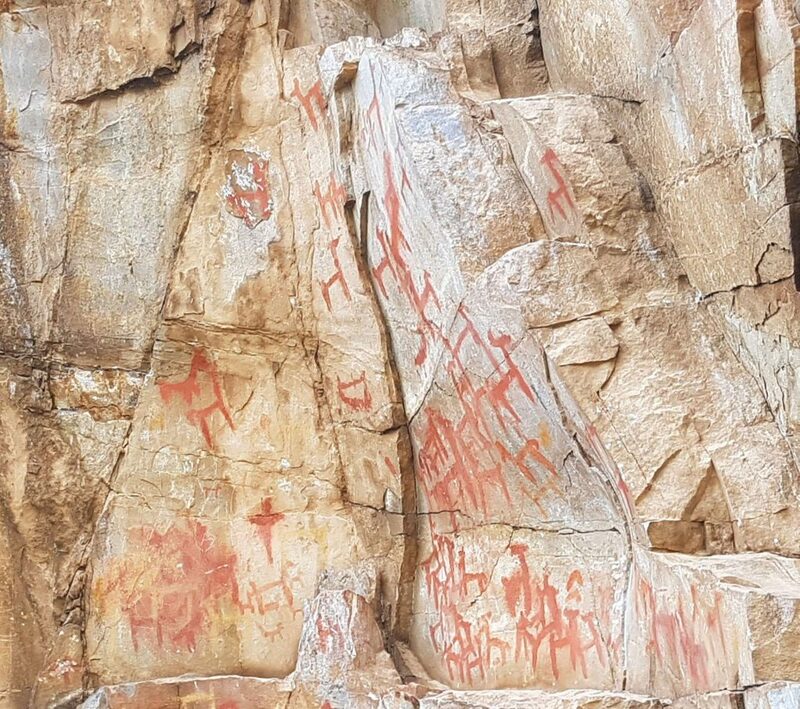 The red pictographs of llamas have thinned and faded with time, and our hosts tell us they are thought to be thousands of years old. The path to them is little more than a decaying ledge on the mountainside that whittles into nothing. But to our right are llamas of every size. Posturing, bending, arching—a veritable Andean version of Kama Sutra visually lies before us. 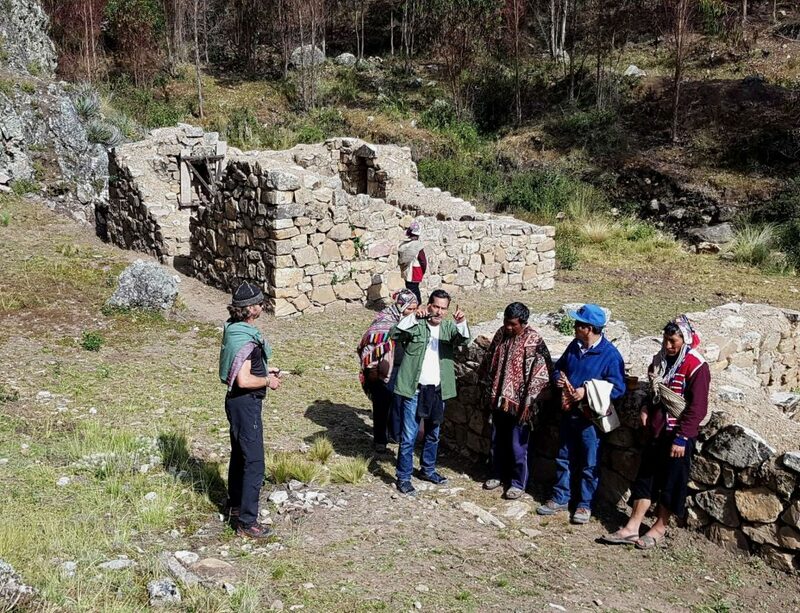 The ruins near Chawaytiri were an Inca chaquis’ (message runners’) outpost or rest stop, as they relayed messages from the Inca emperor along the Great Inca Road. “This one here is about to mount this one there,” the ever-humourful Alex opines. Uneven, faded, cracked, it occurs to me the pictographs remain a primal reminder of ayni, of Andean reciprocity: homage to the beings that work with us in this vast geo-giant landscape. The ancient llama pictographs on the rockface near Chawaytiri are thought to date back at least a few thousand years. 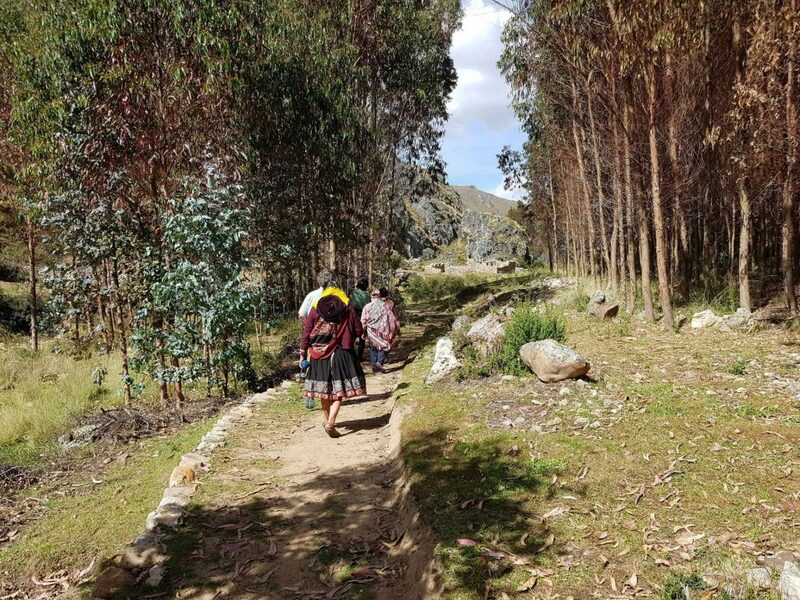 Integral to the Inca Road’s history, and somewhat oversimplified (according to many) by the colonial Spanish, is that many contributing routes had a particular specialty. There were routes for coca, routes for the chaquis messengers, routes that brought fish from the Pacific Coast to the high puna region, and routes around Chawaytiri which dealt with llamas. Alex is on one of his delightful rants, while Jackie tells anyone who will listen: “Under no circumstances is anyone to listen to Alex!” Alex’s bombast is impossible to ignore, and provides a kind of manic break in our days. Anything overly cerebral around him is instantly annihilated to an “Alex session,” which I’ve come to call them. He knows well how his community in the highlands may lack many things, but knows too (or at least is suspect of) the temptation to forget the natural world in places of too much material goods. Coca, not surprisingly, is fuelling everyone, and when one wants to chew, one must first offer every person in range some leaves before taking any for oneself. Every single time, it is the same. 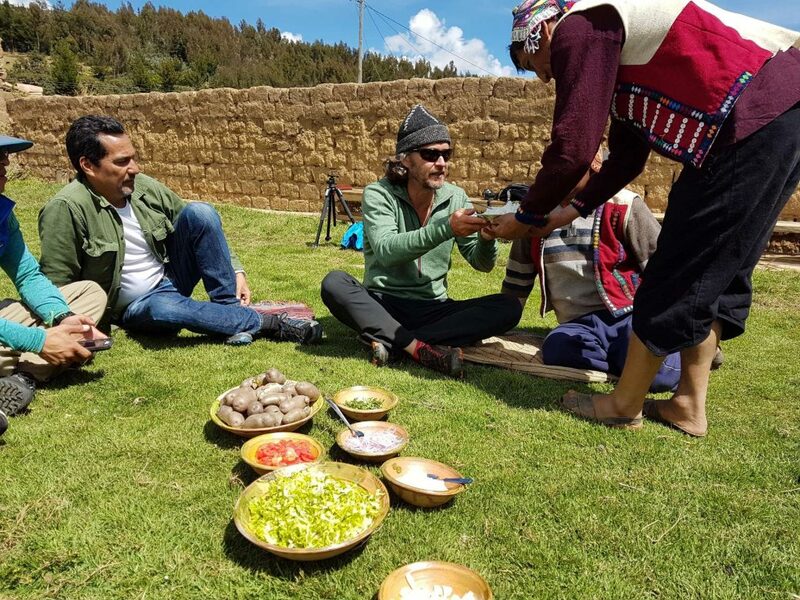 We were offered a spectacular lunch of soup, classic Peruvian potatoes, and salad at Chawayatiri! 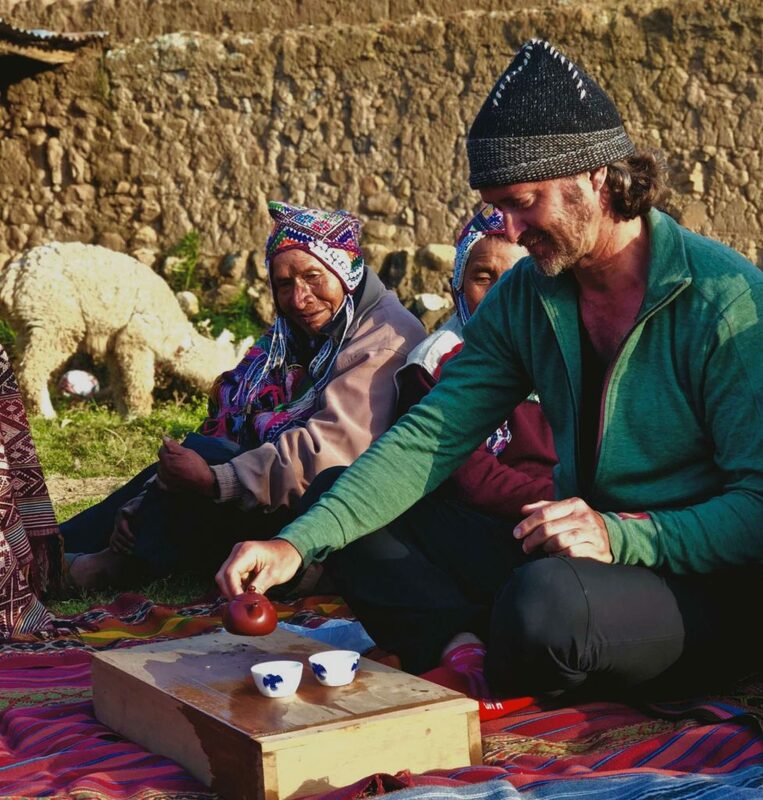 Jeff serving his Puerh tea to his new friends. A serious offence, and one I feel is becoming ever more serious in my ongoing journey. My coca intake is gently climbing, and there is within, every so often, a slight concern. Sitting in a circle of villagers divvying up who will sleep where in the little village of sun and llamas, it is time to offer something to the local families from our side. Nothing grand or opulent, but something in the spirit of tribute—and in the word that has come to infest my mind: ayni. 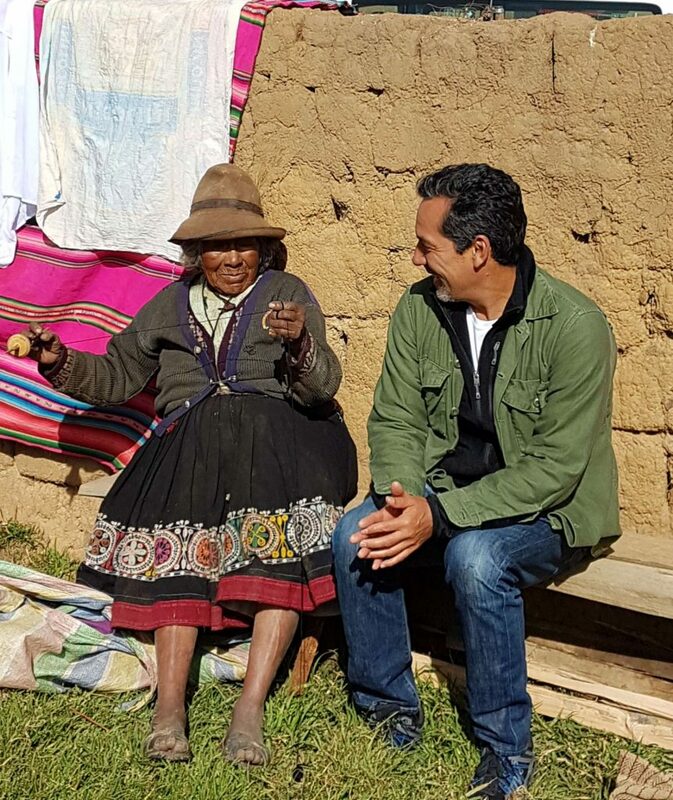 Jackie Bobrowsky, of Mountain Lodges of Peru, and part of our local team, speaking with a Chawaytiri woman who told us she was 120 years old—and still spins wool and weaves every day. The offering will also allay some of my guilt about how much coca I’ve been enjoying from Luciano’s stash! We’ve been offered food, coca and chicha (the local alcohol made from fermented corn)—and it is time to reciprocate. 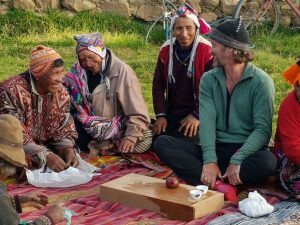 After lunch and visiting the pictographs, Jeff and the community sit in the afternoon sun, sharing coca. Taking out my little pot and filling it with tea leaves, I prepare pot after pot and offer it to the villagers as my own meager tribute. All seem to intuitively understand the intention of the moment, though there are comments and snickers at the size of my (very little) pot serving such a large group. At one point, rather ripped on my tea as well as the coca, I offer up a full cake of Puerh tea to Luciano as a thanks. I notice his rather rapacious enjoyment of the tea, and so the decision to part with one of my prized cakes seems something altogether necessary. One timeless stimulant plant from southern Yunnan offered to those whose relationship with another leaf feels parallel. Jeff and Luciano sharing a moment, as the tea cake is divvied up! Without a blip of hesitation, Luciano sets about breaking up the cake into equal portions for each family present. The collective once again is sacrosanct, and that notion of reciprocity proves itself entirely alive and well here. Jeff Fuchs is Outpost’s Editor-at-Large for Asia. 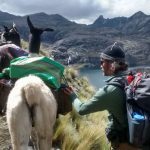 He lived in the Himalayas for almost two decades and led our In From the Outpost PERU team across the Andean valleys and highlands. Read more of his adventures at www.outpostmagazine.com.